Use the full circumference braking and clamping mechanism. The braking mechanism is designed with full 360∘circumference hydraulic clamping. The hydraulic clamping synchronized clamping for the entire table. The clamping area on the entire circumference of the table features maximum rigidity and is ideal for heavy cutting application. 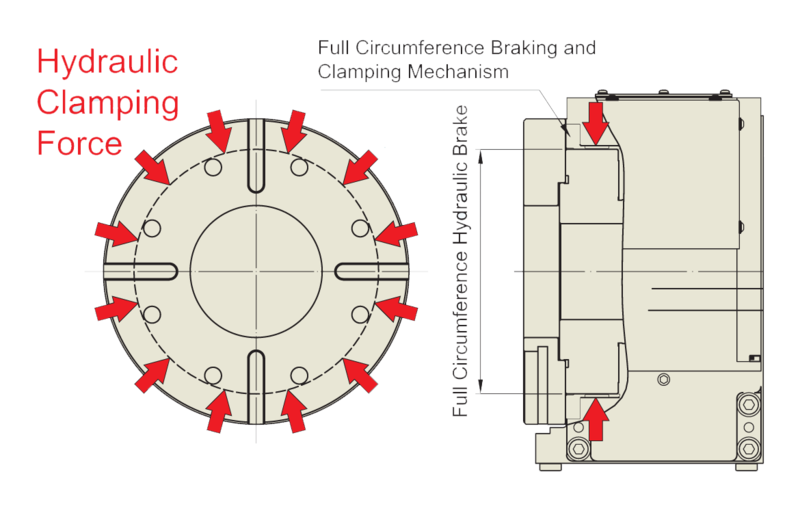 The clamping force is bigger than of conventional disk braking systems. Use the conventional disk braking systems. Table deformation and accuracy deterioration usually occurs on disk braking systems. Only suitable for light-cutting with its low rigidity. It provides less clamping area and longer distance from the cutting position, causing bigger deviation of table.